Well, it has been a pretty incredible winter break for snow. Round two moved in yesterday afternoon, threatening to nearly match our pre-Christmas blizzard of about a week ago. We ended up with a good replenishment of snow, but only about 8" this time. Things are still mighty white around here, though, and another bout is forecast for tonight. Anyway, an interesting drama played out in our backyard yesterday afternoon as it was beginning to get dark. Char said there was a Sharpie in the backyard. Sure enough, there was a juvenile Sharp-shinned Hawk plucking the feathers off of a Red-winged Blackbird beyond our feeders by the back fence. 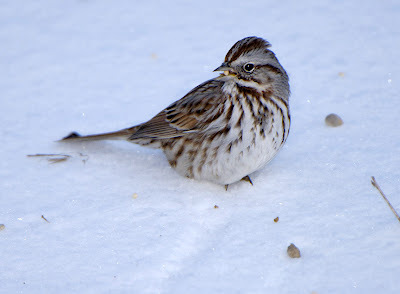 (Check out the adult Sharpie that has been haunting our yard this winter here...) Mostly black feathers littered the snow around the scene, with some red epaulette feathers tossed about dramatically. 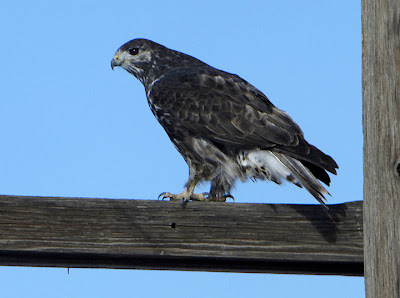 I set my scope up in our back door, shooting with my digiscoping rig across the yard. In the intensifying snow and darkening early evening light, I was only getting shutter speeds of 1/50 of a second at best, and often dropping down to 1/20 second. This is exactly why I like to use a digital camera adapter and remote shutter release, to get things as steady as possible for sharp images. 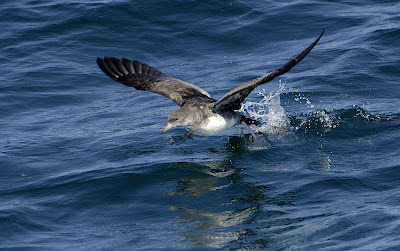 Even then, most of my shots of the actively feeding bird were blurry due to its movement. The only sharp ones came as the bird froze to look at something or in response to my pishing or rapping on the window. Definitely a story of contrasting sides. The RWBL must have been coming in for a last feed before the night of nasty weather set in. My feeders could have been an oasis of sustenance not far from the refuge of cottonwood and willow trees and the cattail marsh beyond. Instead, they became a field of ambush and the blackbird lost the gamble. Perhaps urgency to beat the nighttime blizzard overcame its normal prudence and caution. Maybe it almost got away, or maybe it never saw the sharpie coming in its attempt to top off on calories one more time before darkness and snowfall. 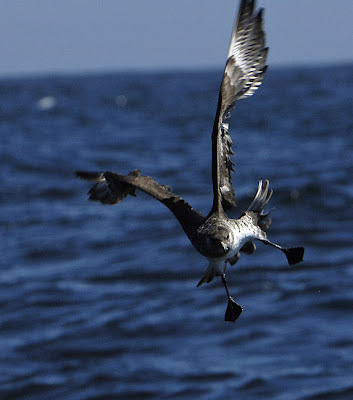 Whatever the case, its need for caloric intake is over, and it instead provided calories for another bird higher on the food web. Feeder became feedee. 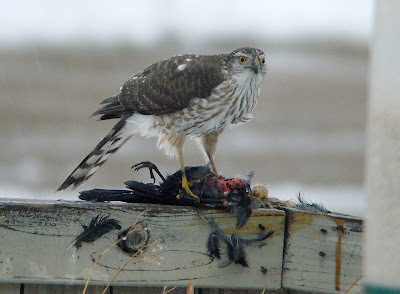 From the Sharpie's perspective, the blackbird kill represented a huge life-sustaining success. 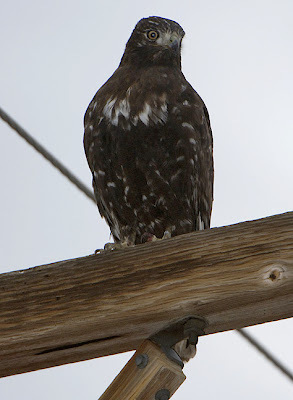 We saw the hawk sitting on a feeder earlier in the afternoon empty-taloned- clearly that ingress into our yard was an energy-wasting failure. With this later success, though, the raptor could go to heavy cover, perhaps deep in a spruce, to wait out the storm with a full crop. 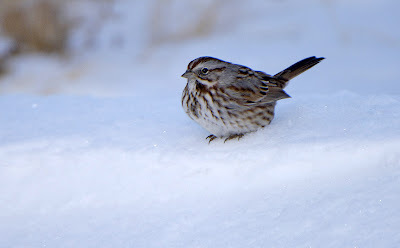 At about 52 grams, a Red-winged Blackbird is substantially larger than the House Sparrows (28 grams ) or House Finches (21 grams) that we often see Sharpies take in our yard. (Weights from the Sibley Guide to Birds.) 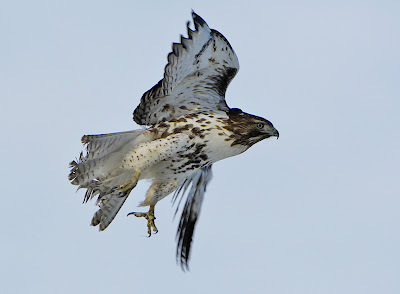 If the hawk is a male, it probably only weighs around 100 grams- this would be a take-down of about half its size. 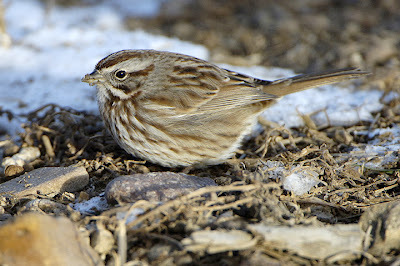 If female, it weighs perhaps 50 to 100 grams more (SSHA masses from Hawk Mountain banding data.) 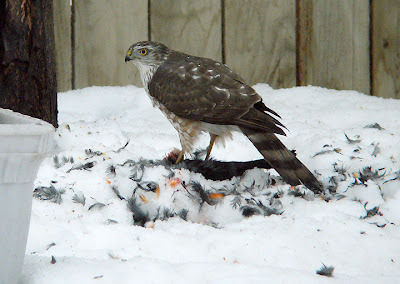 Either way, that is a significant kill for the bird, one that will go a long way towards surviving many days of tough weather. So take your side, mourning the Red-winged Blackbird or cheering the Sharp-shinned Hawk. 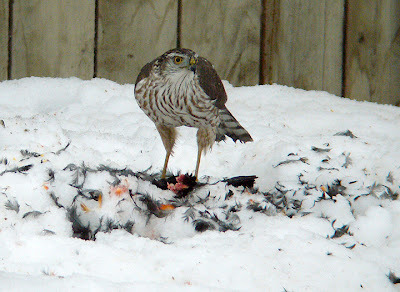 Or refuse to take sides, instead just marveling in the constant battle for survival, even in our back yards. Even though our big pre-Christmas blizzard ended about 5 days ago, getting around anywhere except for main roads still requires 4wd and decent clearance. We ended up with about two feet of snow at our house, and some areas in the region reached the three foot mark. Can't just sit around forever, though, so I decided now that the family visits are wrapped up it was time to take advantage of the sunny, crisp weather to see what's about. I bopped around eastern Boulder and Western Weld counties this afternoon- here are a few highlights. 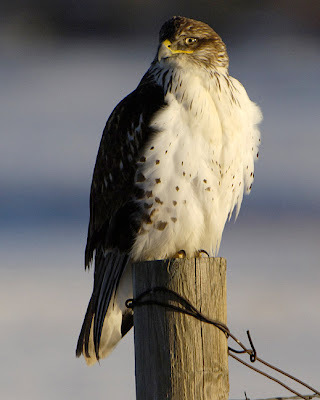 Ferruginous Hawks- these aren't called Buteo regalis for nothing- indeed they are regal. 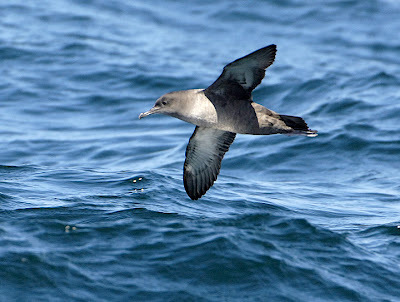 The first one is a juvenile (by the pale iris & lack of reddish "leggings"). 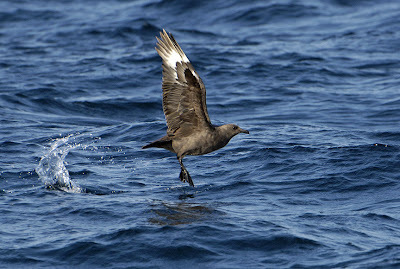 Compare it with the second bird, an adult taking off. 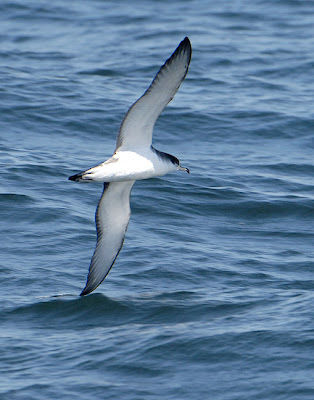 Check out the size of the bill and gape (fleshy corner of the mouth under the eye)- these guys can gulp big prey. Although uncommon (probably less than 8,000 breeding pairs in the US & Canada), we get fair numbers in the winter hanging out around prairie dog towns. 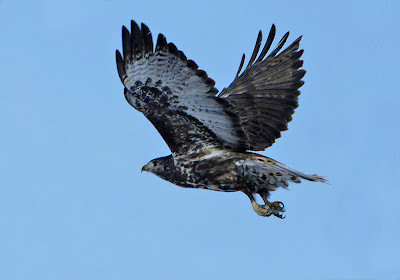 Harlan's Red-tailed Hawks- Certainly my favorite form of 'tail. Ironic that they don't really get red tails (well, some adults get a bit of red on the base of the tail), but goes to show how variable this species is. 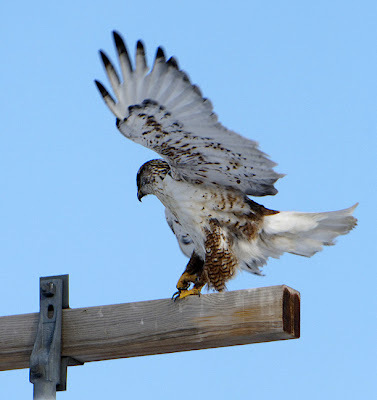 Unlike most Red-tailed Hawk subspecies, dark colored birds prevail within Harlan's. 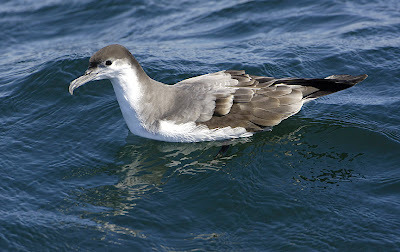 These birds come a long way to winter here, breeding in Alaska, Yukon Territory, and N. British Columbia. 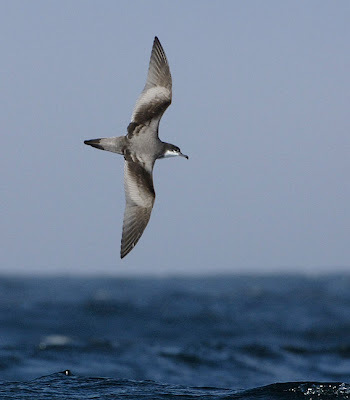 Here's a juvenile (pale iris) and an adult (dark iris) I've seen of late. OK, don't get the idea I only do raptors all of the time. 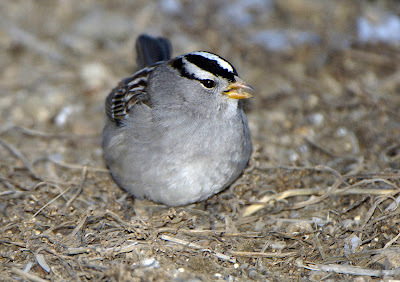 I also stopped and watched a group of Song and White-crowned Sparrows that had found a blown-off bare patch of ground to forage on. Luckily for me, it was close to a quiet back road that I could stop on, driver's side on the left shoulder so I could shoot out of my window. 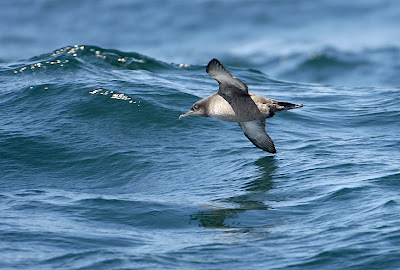 Photographing fast-flying, rapidly wheeling birds from a rolling boat while coping with salt spray and a protesting stomach can be, um, challenging. But somehow I get more excited about this kind of photography than anything else. All I can say is thank goodness for image stabilization, AF-S autofocus, 5 fps continuous shooting, and large memory cards. 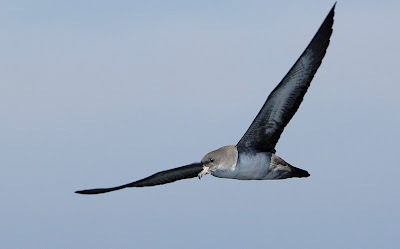 And thank goodness for all of the sunshine we had on our two days out- on previous pelagics that I've done I had much tougher light to work with. 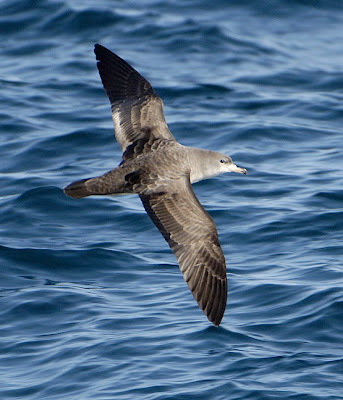 While not as abundant, there were still lots of Pink-footed Shearwaters. For some reason they seemed to approach the boat more frequently, though. Some even landed in the wake to get in on the chum-grabbing frenzy. 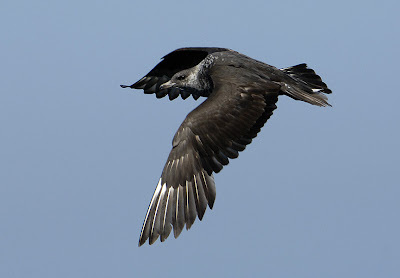 A couple of these shots show how this bird group got its name- by knifing a wingtip along the water. Very sharp looking birds! 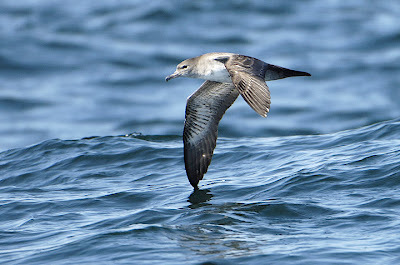 Probably the nattiest shearwater we saw, though, was Buller's. 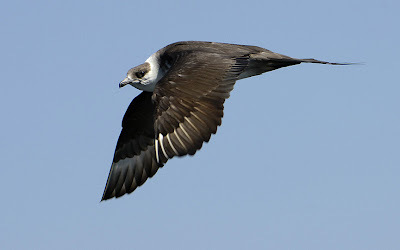 The pattern on their back is pretty sweet, kind of like a Sabine's Gull, and their underparts are gleaming white. 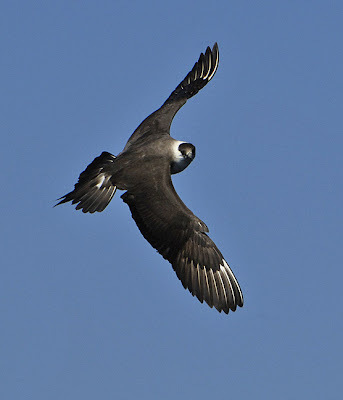 There were fewer of these than Sooties or Pink-footeds, but still plenty for great observations and photo opps. 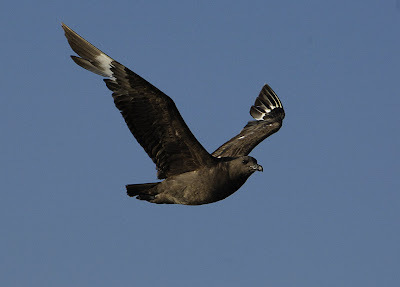 Again you'll see a couple of these shearing the water with a wingtip. 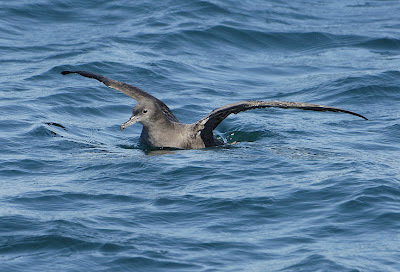 Another fun thing about pelagic trips is the potential for marine mammal sightings. 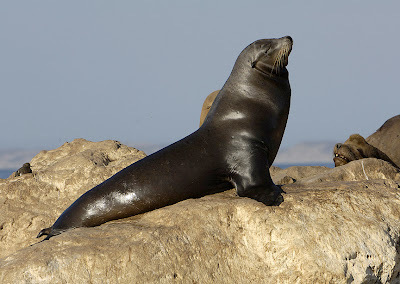 A trip out of Monterey guarantees some cool blubber-bearing critters, although each day may hold its own special surprise. 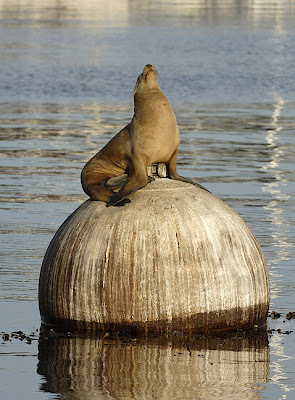 Right in the harbor, California Sea Lions are easy to spot. Even better, though, is encountering a group out in the bay. 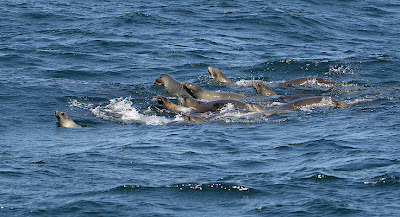 At sea they seem to forage in small groups, each animal looking sleek and fast. 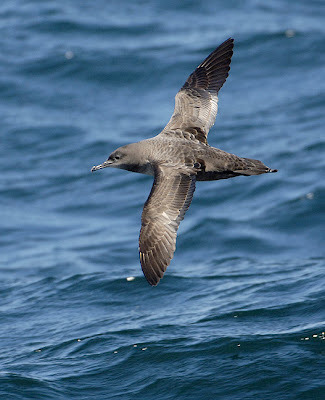 They are also pretty wary (based on my sample size of about 5 such encounters...)- they'll watch the boat coming and then break away at speed, schooling remarkably like small fish- no small feat for animals weighing hundreds of pounds each. 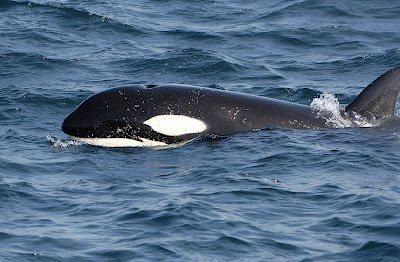 But the big mammal stars out there, of course, are the whales. 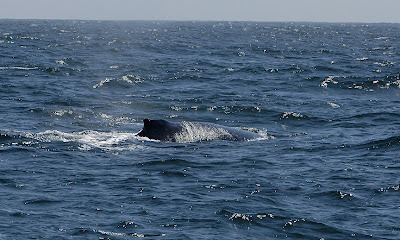 Humpback Whales were visible from the shoreline highway south of Monterey, and we saw numerous individuals each day from the boat. Unfortunately I didn't see or photograph any doing spectacular breaches, but here's a shot of what you typically see when they spout. 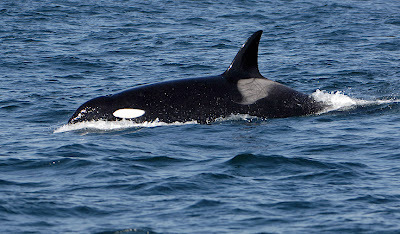 Other whales we saw included Pacific White-Sided Dolphin, Risso's Dolphin, Northern Right Whale Dolphin, and Harbor Porpoise. 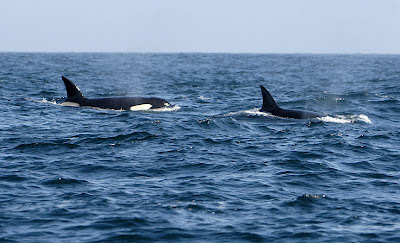 I was disappointed to learn that Blue Whales weren't being seen in the bay this fall, but that was more than made up when we encountered the "friendly pod" of transient Killer Whales both days out on the boat. 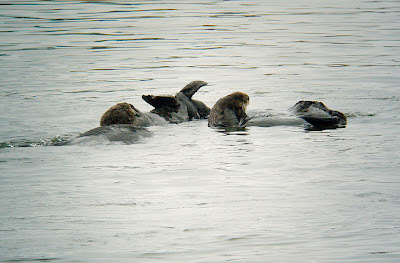 Each time, the pod approached the boat and loitered nearby as we sat idling, showing off a trophy scrap of seal. 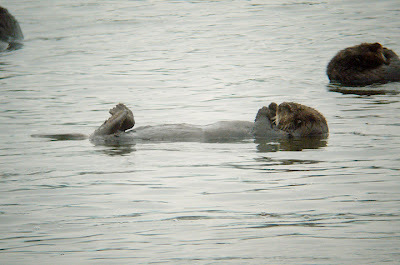 At times you could look down into the water at them, they were so close. 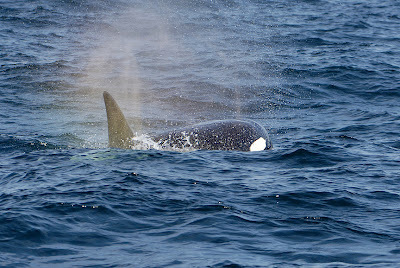 I even got Orca blowhole mist on my face once when one spouted nearby upwind. Several times, one would engage in a bout of tail slapping. 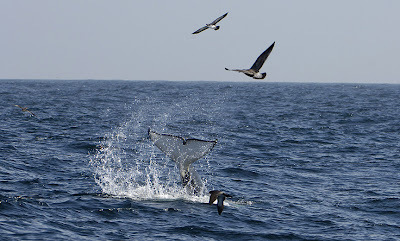 Even the official whale-watch cruises have trouble regularly finding these amazing animals- we were so lucky! 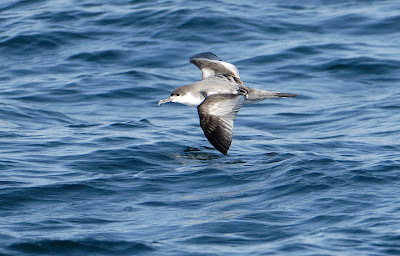 As a birder I almost hate to say it, but I think for most folks they may have been the highlight of the two days' worth of pelagic birding. 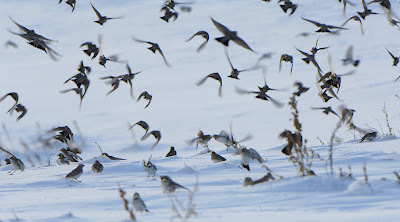 Quiz: Can you ID the birds in this pic? I'm a big owl fan, and this one is pretty funny- good combo for a bird-related comic. Without further ado, I present for your review this F-Minus masterpiece. So the Yellow-billed Loon I previously commented on didn't make it- a very sad ending to a very cool bird. 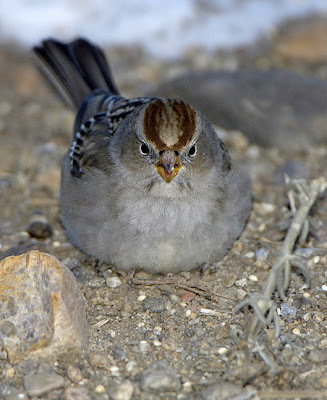 Joe Prentice sums it all up in his Words on Birds column, a regular feature in the Boulder Daily Camera.